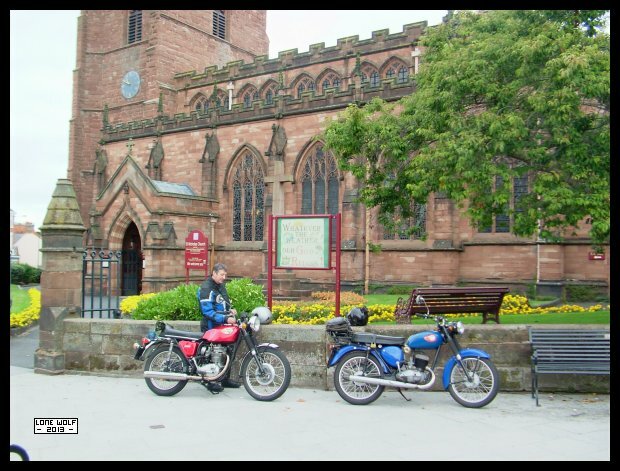 Two 1971 "J" reg BSAs parked next to the church in Newport - next stop . . . The Ponderosa. Monday saw me getting hernia inspired surgery at Sandwell hospital - thanks to Ian for the lift there. Tuesday and I seem to have survived the surgery - by teatime I was back home - thanks to Andy for the lift home. Wednesday was spent trying not to move around too much. Thursday I felt up to messing around in the garage - so that's what I did. Friday and I was back on two wheels again - so dinner at Eljay's Cafe was called for. Sunday saw the Bantam going on a "pre Ace Cafe" run up to the Ponderosa. Apart from working the rear sprocket bolts loose, the Bantam did well - and my surgery didn't give me any trouble.